We developed a racing full exhaust system dedicated to ’18 Ninja400. Weight is lighter about 2.8kg than genuine exhaust (about 6.6kg). We developed a full exhaust system dedicated to ’18 Ninja400. 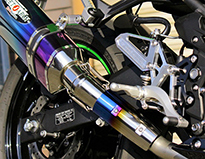 The exhaust pipe is made of Titanium, and the silencer is made of Titanium or Blue Titanium. Weight is lighter about 4.1kg than genuine exhaust (about 6.6kg). We developed a SLIP ON type dedicated to ’18 Ninja400. The name is 'NASSERT Evolution Type II SLIP ON'. The joint pipe is made of Titanium, and the silencer is made of Titanium or Blue Titanium. Weight is lighter about 2.0kg than genuine exhaust (about 4.0kg). It comes with dedicated silencer stay and heat guard.